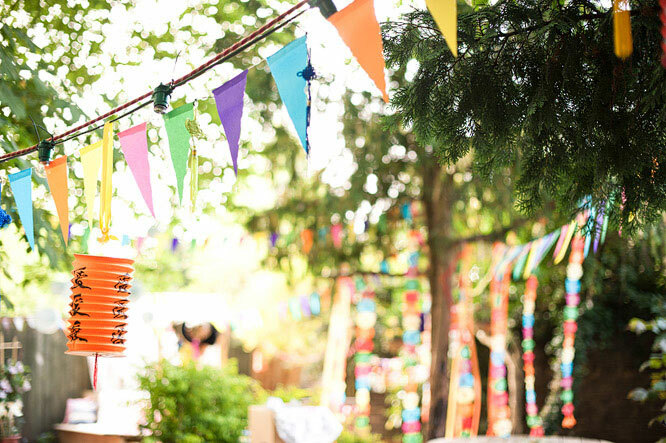 Looking for birthday party decor ideas? Have you checked any wedding blogs lately? Sometimes, you can find the most amazing inspiration from weddings! Case in point: this ten-kinds-of-beautiful wedding reception that was photographed by Anushe of Anushe Low Photography. 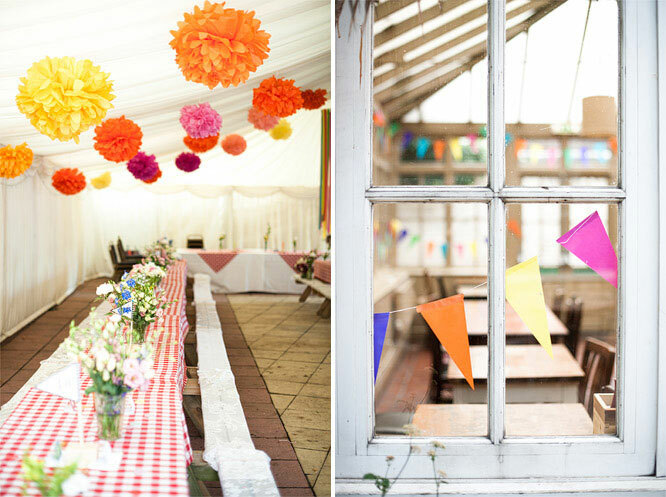 The bride, Marsha, went all-out with DIY details that would be gorgeous (and affordable) for any party. Hanging jam jar tealight holders accent a fence, and circular tissue paper streamers (sewn together on a sewing machine) are bright and cheerful. Bunting in every color of the rainbow hangs from the trees. Show-stopping chandeliers (that are what, 25 feet long?!) 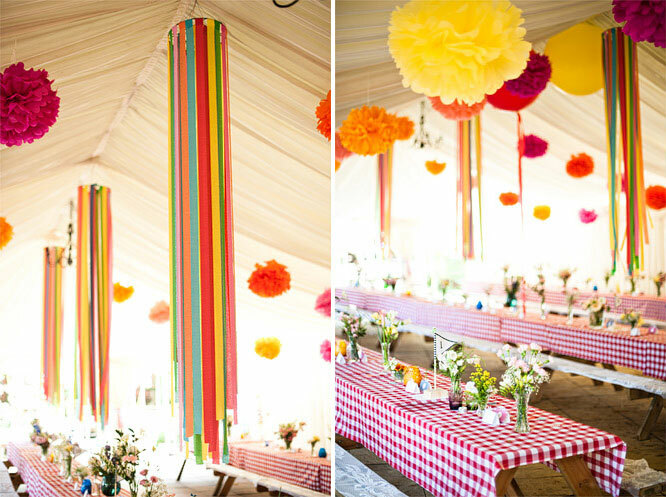 hang from the reception tent ceiling. The idea could easily be applied on a smaller scale, too. For dozens more magical photographs from this wedding, please visit Anushe Low Photography. Photos are posted with permission from Anushe Low Photography. Thank you Anushe! The long chandeliers are amazing! So pretty! 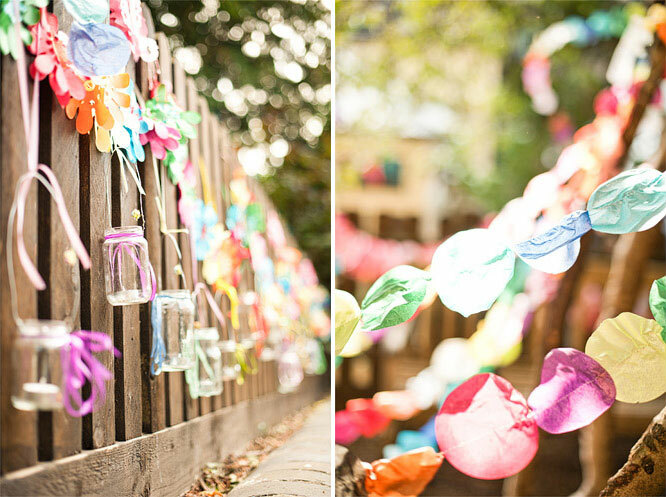 I love the mason jars and paper flowers against the fence!